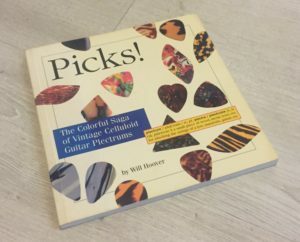 Many years ago, I found a book on what I still think is one of the best niche hobbies ever: guitar pick collecting. I obviously bought it, but while I have many strange collectible hobbies (did anyone say pencils?) I’ve managed to just observe this one from afar. In fact, for years I never used a pick on guitar. Sometimes I’d break out a heavy one playing bass, but even then, fingers were my preferred style. With The Magnificent Compañeros now in full swing and with it my role as a rhythm guitarist, I’ve had to embrace the pick. Now I’ve always had a box (a wonderful antique sterling silver cigarette box my stepdad gave me) with a good selection of picks in it so I had the opportunity to try a few out. Initially I gravitated towards lighter picks. Playing at home they seemed more mellow and easier to manage. Then at the first rehearsal I was going through about one a song! Obviously there’s a big difference between a gentle strum at home and a fully-fledged wig out in a rehearsal room! I started moving up the thickness scale and have now settled on Dunlop’s green Tortex model that’s .88mm thick. This falls at the low end of the “heavy” pick range, but it feels just right to me. I’m glad I went through a bunch of thicknesses though as it’s at least made me aware of when a different thickness may be useful – especially in recording. The next part of the pick selection equation isn’t so easy. Once you’ve discovered what weight of pick feels right there are a myriad of shapes and styles. Now I think I like Tortex the best, and the standard shape is fine, but is there a material or shape that just feels better? 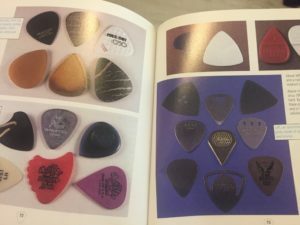 I find it frustrating that I can buy a sample pack of a dozen Jim Dunlop picks in a variety of weights, but I can’t buy a sample pack of picks in one weight but a variety of styles. I reckon this would be a great way to try things out. Instead it’s a trip to the shop to go through the pick box grabbing a bunch. I suppose this is half the fun, but often shops only carry the most popular styles so you can miss out on a potentially perfect pick for you. Anyway, that’s my thoughts on picks. If nothing else it gives me the excuse to show a couple of pics from the book I bought all those years ago! And if anyone from Jim Dunlop reads this, please think about the idea of a “style variety” pack – and it’d be cool if you could send me one!! !